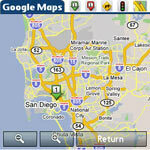 Another update to Google’s Mobile Maps software for Palm OS has been released. This new version, 1.2.0.9, appeared quietly yesterday, exactly two months since the program's last update. Google's mobile map page unfortunately still has not been updated to indicate the actual version number currently available. Google also does not post change logs for their app but this is not a major drawback due to the ease with which Google Maps can be downloaded and installed directly as a PRC file on any Palm OS device with internet access. The supported Palm OS-based devices on Google’s website are specifically listed as the Palm TX handheld and the 600, 650, 680 and 700p smartphones. The recently-released Treo 755p contains an older version of Google maps in ROM and is fully compatible with this update. In fact, reports indicate, installing 1.2.0.9 on a 755p makes the new version the default version for mapping from the Treo’s Contacts app, completely overriding the default version. Google Mobile Maps can be freely downloaded from www.google.com/gmm/treo within Blazer and installed without HotSync via the integrated Nutshell auto-installer. Gogle Mobile Maps 1.2.0.9 occupies ~567kb of available device memory in its default installed state, not counting any cached maps. Awesome App... Where is the GPS Support? This is by far, the best mapping program, and then add in even more in terms of directions, photo views, business search, direct link to dial returned business telephone numbers, etc. Now, the Treo-W models already have the GPS ability as does the blackberry model. When are they going to add GPS to the palm model. With that, I would be in hog heaven! RE: Awesome App... Where is the GPS Support? I agree with your sentiments concerning Google Maps. The only problem I see with it is that the road labels often fall underneath the highlighted route marker, obscuring the number of the road it is sending you on. Otherwise tremendous. I'm currently reviewing the Treo 750 - apart from the GPS support, Google Maps on Palm OS Treos is actually much nicer than Google Maps on WinMob Treos. At 240x240, the maps and the satellite views are kinda ugly. Not only that, but WinMob has to show the upper status bar and the softkey labels at the bottom of the screen, so the actually 'window' you have to look at the maps is smaller too. Plus, with all options hidden under the one menu, it takes more effort to manipulate. Just installed it on my TX...works great! Visor (2MB)=> Visor Platinum => Visor Prism => Sony S320 => Sony SL10 => Sony SJ33 => Palm IIIXE => Palm Vx => Palm m505 => Palm TX => ?APPLE iPHONE? It went from 1.2.0.8 to 1.2.0.9. 1 is the major version number. 2 is the minor version number. 0 is the patch number. 9 is the "totally insignificant tweak" number. For the recent versions of Google Map, I found that it crashes every time I exit the Google Map with CJKOS turned on. CJKOS is the Chinese overlay software which is bundled with Treo 680 in Hong Kong and is used mostly by Hong Kong and Taiwan Treo users. Is this a known issue to anyone else? I hadn't upgraded from ver. 1.0.0 on my Chinese TX (don't use it enough to keep it up to date). I did notice that when I did just start it up, I got a message that will require me to upgrade to version 1.2.0.9 by October 15. I don't know what will happen if I don't. In any case you might want to contact them and let them know of the bug. If they require an upgrade that kills it, that isn't too good of an upgrade. Unfortunately when I tried to upgrade to test out the new version, I get that "out of memory error" when trying to save the file. Hmm, I wish I could remember what I did last time to solve that one. I've written to google numerous times asking that they allow for zooming beyond the avaliable resolution of the satellite images. I realize this would only mean blowing up the images and not result in any increased details, but am I the only one who would rather be able to increase the size of the images than squint at the tiny display? Great program, I didn't realize it would work on anything other than a Treo. My only issue is that you can't cache maps to an SD card eliminating the need for permanent GPRS connection. If you think a Foleo will sell and a PDA wont you're out of your mind.